What to do with all those Easter eggs? If your family is anything like mine, you made lots of hard boiled eggs for Easter, and after the holiday you are left with more eggs than you know what to do with. A tradition in my family is for someone in the family to decorate several dozen eggs for “egg fights” after Easter dinner. Everyone takes an egg, and one by one we tap the eggs together. The one that cracks is set aside until we go back and do the other end of the eggs and the egg that did not crack continues on trying to crack other eggs until it is cracked. After the egg fights have finished we peel all the eggs and put them back in the fridge to stay cool. After I’ve finished cleaning up after the meal I take the left over eggs and transform them into delicious pickled eggs. This is a very simple process that makes sure no eggs are wasted, and they make a tasty, protein rich snack or addition to salads and other dishes! 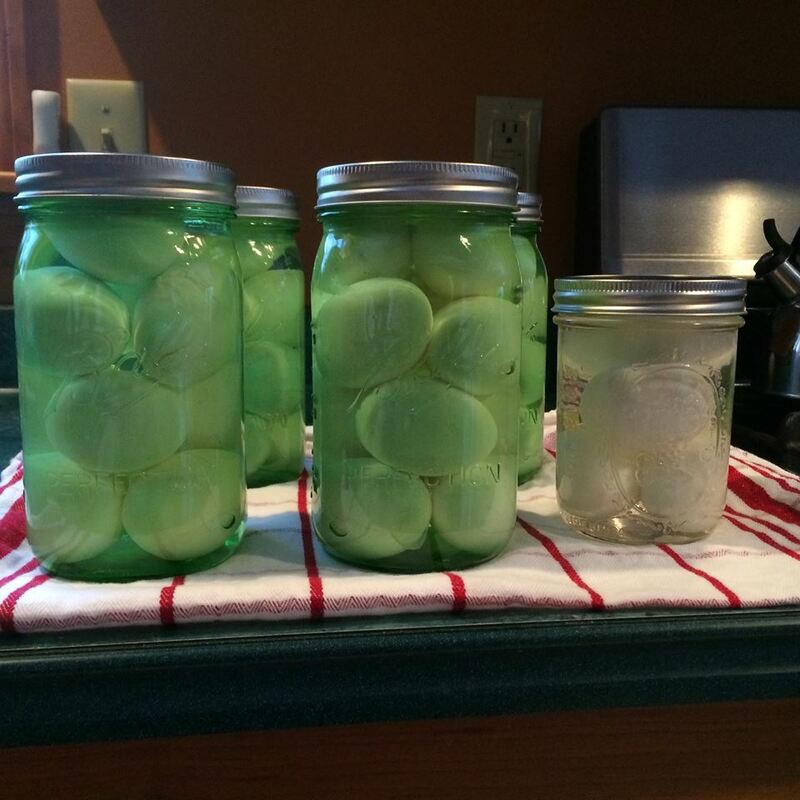 There are many recipes out there for pickled eggs, and as many ways to prepare them; below is how I make mine. Happy Easter! Start with hard boiled eggs. You can make them fresh, or if using left overs from your Easter meal please make sure they have been kept cold. Prepare appropriately sized canning jars for the amount of eggs you wish to pickle (I typically get 10-12 eggs per quart, but this will vary based on the size of your egg). Wash the jars carefully, making sure to rise off any soap residue. Put lids in a small pan to simmer (not boil) and set clean rings aside. Prepare a hot water bath and boil jars to sterilize them. This will ensure there is no harmful bacteria and help make sure the jars don’t crack when you add the pickling brine. While your jars are boiling, combine enough vinegar and salt to cover your eggs at a ratio of two cups of vinegar to 1 TBS of pickling salt and bring to a boil. You’ll need about two cups of pickling brine for each dozen of eggs, depending on how densely your jars are packed. Remove jars from water bath (a jar lifter can be helpful here) and pack with eggs. Carefully pour pickling brine over the eggs until they are covered but being sure to allow a small amount of head space. Place lids and bands on jars and secure until fingertip tight. Allow to cool a short time on the counter (do not leave them too long!) then place in the refrigerator. Over time the eggs will absorb the pickling brine and become flavorful. The vinegar and salt also help to preserve the eggs. Let the eggs season for at least two days and four weeks. To avoid botulism, store eggs in the refrigerator and do not allow them to be at room temperature for more than two hours. For best flavor use your eggs within 3-4 months.